The third fieldwork season of H.U.N.E. took place from February 4th April 1st, 2006. 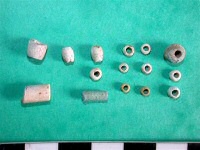 The systematic survey of the mainland area and of Us island were completed; several excavations were undertaken. Unfortunately, the political situation in the research area prevented the execution of the campaign as planned. In the area to be flooded by the dam currently under construction, ca. 50,000 inhabitants face evacuation. They belong to the Muslim tribe of the Manasir. In early 2006, the Manasir decided to expand their civil resistance against the conditions of their evacuation and the proposed compensation package. In this context, they resolved to expel all archaeologists active in the region. They were hoping to thereby mark their resistance, to attract national and international attention to their situation and – ideally – to delay the flooding by hindering archaeological research. Members of the H.U.N.E. mission organised a meeting with the Manasir Committee. At this meeting, which took place on February 20th 2006 at Salamat, that decision was discussed comprehensively, but finally upheld. Since the H.U.N.E. mission respects and supports the interests of the Mansir, we left the 4th Cataract research area a few days later. We hope to be able to restart fieldwork in the island concession in spring 2007. 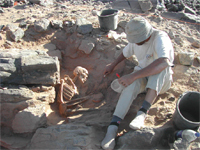 The Sudanese antiquities service explicitly asked the missions to conduct a further fieldwork campaign, and the Manasir Committee has also promised its support. To prevent a premature end to the 2006 spring campaign, the H.U.N.E. mission successfully attempted to gain a further concession outside the area to be flooded. From February 25th, the island team could continue its activities on the island of Mograt. With a length of 30 km, Mograt is the largest island in the entire Nile. It is located between the 4th and 5th Cataracts, near the modern town of Abu Hamed, in the region where the land route from Egypt through the Eastern Desert rejoins the Nile Valley. Thus, Mograt is in a socio-politically significant position and promises interesting archaeological finds. The island is archaeologically largely unexplored, no excavations have ever taken place there. In five days of fieldwork, 65 new sites were documented on Us. They support and complement the picture of the island’s settlement history that had crystallised in previous campaigns. The oldest sites date to the late prehistoric periods, i.e. the Mesolithic and the Neolithic. 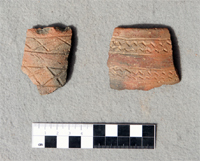 A first apex of settlement activity dates to the Kerma period in the 3rd and 2nd millennium BC. Many cemeteries from this period were found in the area explored. The arrangement and size of the grave superstructures suggest that the cemetery organisation reflects a social hierarchy. For the first time in the H.U.N.E. 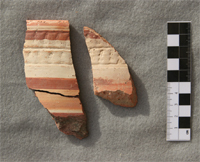 concession, we found the ceramic “type fossil” of the Meroitic period (3rd century BC to 3rd century AD), a typical painted and stamped ware known from many regions of the Nubian Nile valley. 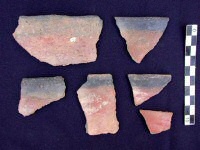 Fragments of this ware were discovered in cemetery US036. Much richer, however, is the evidence for the following post-Meroitic period (4th to 7th centuries AD). In the 2006 survey, it was represented by five cemeteries. Their characteristic are monumental grave superstructures in the form of earthen tumuli or stone circles. Cemeteries of this period were typically constructed in broad sandy valleys, far from the settlement areas near the river. The key reason for this choice of location is probably the soft sediment of the valley bottoms, which would have facilitated the heaping up of large tumuli and the excavation of large grave structures. In terms of quantity, the Christian period (7th to 15th centuries AD) is most strongly represented. Not only cemeteries, with their typical stone box graves, but also numerous settlements from this period are present. The largest was documented this year on the northern tip of Us. It measures ca. 20.000 square metres and contains several terraced structures on the natural steps towards the shore of the river, which may be defensive in character. Unfortunately, the site could not be fully recorded, due to the premature cessation of fieldwork. Near site US022, where a late Christian church had been excavated during the 2005 campaign, an excavation concentrated on a brick-making kiln (US025). Beyond doubt, it served to produce the building material for church US022.A. A first exploration of the island on foot and by car documented 60 sites. Among the most remarkable discoveries are twelve sites with stone tools from the Palaeolithic (probably Middle and Upper Palaeolithic: ca. 300,000 to 20,000 BC). 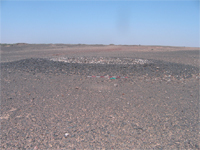 Sites of this period are very rare in the Nubian Nile valley; the Mograt material is thus exceptional and should be examined in detail in future years. Neolithic sites also occur in surprising numbers and extents. Several cemeteries can probably be ascribed to Kerma period; should this dating be correct, it would provide the most easterly occurrence of that cultural level so far recognised. 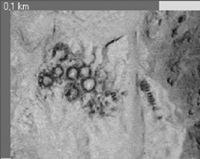 Especially noteworthy are several monumental tumuli on the site MOG034. 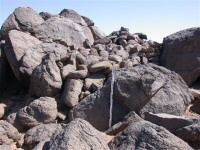 Their covering of black and white pebbles resembles the graves of the eponymous site of Kerma on the 3rd Cataract. 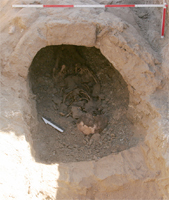 The Mograt survey also identified numerous cemeteries of the Napatan period (8th to 4th centuries BC). Their surfaces repeatedly yielded imported Egyptian pottery, indicating close contact with centres further downriver. Further, several post-Meroitic and Christian cemeteries were recorded, as were some fortifications from the Christian period. 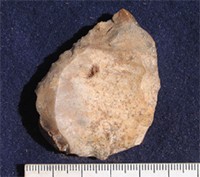 a Middle Palaeolithic site (MOG024). a Napatan cemetery (MOG012), where two graves containing complete burials were excavated. 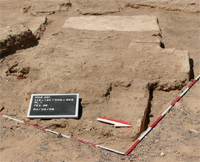 a Christian cemetery (MOG001), where a total of 30 grave superstructures of brick, two of them on a cruciform plan, were excavated; further, the grave under the largest structure was examined, it included a complete burial under a brick vault. the remains of a mudbrick structure (MOG003), which turned out not to be a church (as expected), but a profane structure from the Islamic period. The fortification of Gebel al-Hilla was mapped in detail. This 5000 square metre complex, located on a rocky ridge near the river, is the most prominent monument on Mograt and was already mentioned by early European travellers. Surface finds permit a dating to the Christian period, but apparently it was used continuously into the Islamic period. Der folgende Bericht bezieht sich auf die Aktivitäten der Humboldt University Nubian Expedition am linken Nilufer zwischen dem Gebel Musa und Salamat im Februar 2006. Wie schon 2005, diente das Dorf Kirbekan als Basisstation und täglicher Ausgangspunkt. Für 2006 waren ein zweiwöchiger Survey und sechs Wochen Grabung an ausgewählten Plätzen geplant. Eine rapide Veränderung der politischen Stimmung vor Ort erzwang jedoch einen vorzeitigen Abbruch der Arbeiten nach knapp drei Wochen vor Ort. Glücklicherweise konnte noch vor der Abreise das ausständige Gebiet der Konzession in Auszügen begangen und ein Friedhof ausgegraben werden. Das ethnographische Projekt zur Siedlungsweise und Wohnarchitektur der modernen Monasir, das 2005 begonnen worden war, fand ebenso eine Fortsetzung. Der nördlichste Bereich der Festlandkonzession der Humboldt Universität zwischen den Dörfern Shellal und Salamat war weder 2004 noch 2005 erforscht worden und stellte so ein dringendes Desiderat für 2006 dar. Die Landschaft wird in diesem Bereich von einem felsigen und eher flachen Hügelland gekennzeichnet. Breite Wadis sind selten; die heutigen Dörfer liegen am Hang und auf der ersten Hügelkette unmittelbar über einem relativ breiten Fruchtlandstreifen. In diesem Bereich wurde in zwei Zweierteams zu Fuß ein Survey durchgeführt, der zeichnerische Skizzen von 88 neu entdeckten Fundplätze, digitale Fotodokumentation und die Einmessung mit GPS-Geräten erbrachte. Aufgrund der Morphologie der oberflächlich sichtbaren Strukturen und des aufgefundenen Fundmaterials können die Fundplätze von 2006 im groben wie folgt verschiedenen Zeithorizonten zugeschrieben werden, wobei bei einigen eine Mehrfachnutzung über unterschiedliche Zeiträume offensichtlich war. Mangels eindeutiger Befundlage können 19 Fundplätze zeitlich nicht näher eingeschränkt werden. Dabei handelt es sich um fünf Siedlungen, fünf Unterstände/Hütten aus Trockenmauerwerk, fünf Steinstrukturen, vier Bruchsteinmauern, eine Ansammlung von Artefakten (Siedlungsplatz), 46 Friedhöfe unterschiedlichsten Typs und verschiedene isolierte Grabanlagen sowie vier Felskunststationen. Acht Fundplätze waren wohl über mehrere Perioden in Benutzung und vereinen verschiedene Aspekte – Grabbauten treten in diesen Fällen gemeinsam mit Siedlungsresten, Bruchsteinmauern, Unterständen und Felskunst auf. Tumuli, die auf den verschiedenen felsigen Hügelkämmen und Plateaus situiert sind, konnten in großer Zahl aufgezeichnet werden. Diese Grabbauten sind bereits aus dem südlichen Konzessionsgebiet und durch andere Missionen im Bereich des Vierten Kataraktes gut bekannt und können der lokalen Kerma-Kultur (ca. 2500-1550 v. Chr.) zugeordnet werden. Bei diesen Tumuli überwiegen zwei Grabformen – einerseits hohe konische Steinhaufen (z.B. ShN 14), andererseits runde bis ovale Steinringe von unterschiedlichen Ausmaßen. So genannte Kuppel- und Felsspaltgräber stellen weitere Grabtypen der Region dar, die besonders stark an die natürliche Landschaft und die Topographie des Kataraktgebietes gebunden sind. Namensgebend für diesen Typ von Gräbern ist eine aus Steinblöcken errichtete Kuppel, die direkt auf den gewachsenen Felsen aufsetzt und an ein Iglu erinnert (ShN 38). Dass Kuppelgräber im gesamten Konzessionsgebiet von H.U.N.E. nachweisbar sind, stellt eine der wichtigsten Erkenntnisse des Surveys von 2006 dar. Bislang war der nördlichste Nachweis dieses Grabtyps im Dorf Mushra gewesen; der kleine Friedhof ShN 27 mit derartigen Grabbauten verlagert den Befund um 13 km weiter nach Norden. Die mit den Fundplätzen assoziierte Keramik spricht dafür, dass sie vorwiegend in die spätere Kerma- bis in Napatanische Zeit zu datieren sind (z.B. ShN 04, ShN 18, ShS 11, ShS 13). Das felsige Hügelland rund um Shellal beherbergt mehrere Siedlungsplätze aus neolithischer Zeit. Davon zeugen Konzentrationen von entsprechenden Keramikscherben und Steinartefakten sowie Steinstrukturen, die als Relikte von ovalen und runden Hütten bzw. Unterständen zu interpretieren sind (z.B. 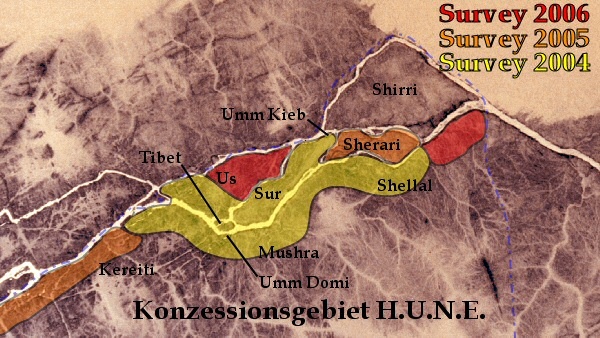 ShN 10, ShN 35 and ShN 37). Der Fundplatz ShS 22 stellt eine gut erhaltene Siedlung aus dem christlichen Mittelalter dar. Mindestens fünf Strukturen konnten dort festgestellt werden; sowohl halbrunde als auch annähernd rechteckige Bauten sind vorhanden. Einraumbauten sind ebenso nachgewiesen wie zwei oder drei Räume bzw. aneinander anschließende Einheiten. Kleine Annexbauten besitzen häufig keinen Eingang und dienten wohl zur Unterbringung von Vieh. Als Baumaterial wurden Lesesteine verwendet, die in unregelmäßigen Lagen übereinander gestapelt wurden. Teilweise wurden die anstehenden Felsen in diese Architektur einbezogen, häufig bilden große Felsbrocken die Rückwand der Bauten, die kaum mehr als einen einfachen Unterstand darstellen. Auf diese Weise wurden vorhandene Steinformationen optimal genutzt. Das Felsbildpanel ShN 19 umfasst ein bislang einzigartiges Motiv in unserem Konzessionsgebiet. Die Fläche des Felsens wird größtenteils von mehreren Rindern mit langen Hörnern eingenommen, die in mindestens drei Reihen übereinander angeordnet sind, wobei einige der Tiere Standlinien besitzen. Nördlich schließt eine menschliche Figur an. Der Grad der Patinierung spricht dafür, dass sowohl die Rinder als auch die Figur aus demselben Zeithorizont stammen. Treiber und Hirten sind häufiger im Verband mit Tieren nachgewiesen, aber die hier dargestellte Person scheint eine Frau zu repräsentieren. In scheinbar tanzender Pose hat sie die Arme über den Kopf gehoben. Auf der Insel Us konnte eine ähnliche Figur im Verband mit Straussen gefunden werden (Näser 2005, US042). ShN 19 scheint am ehesten in den Kerma-Zeithorizont zu datieren, was nicht zu letzt auch aufgrund der hohen Dichte an benachbarten Tumuli dieser Epoche wahrscheinlich ist. Bereits bei der Begehung im Februar 2005 fiel ein Fundplatz in der Nähe des Dorfes Umm Ushira als besonders lohenswert in Hinsicht auf eine kommende Grabung auf. Es handelt sich um einen klassischen Kuppelgrabfriedhof, bei welchem mehrere Gräber zu einer dichten, an Bienenwaben erinnernden Einheit angeordnet waren (KIR 236). Die Steinstrukturen wiesen einen besonders guten Erhaltungszustand auf. Besonders das zentrale Hauptgrab (Grab 2) stand über 1,50 m hoch an und wirkte wie eine mehrstöckige Konstruktion und noch ungeplündert. Der enge Verband der einzelnen Grabbauten in KIR 236 ließ eine verwandtschaftliche Beziehung der Bestatteten zueinander annehmen. Insofern sollte eine Freilegung unter Einbeziehung eines Anthropologen erfolgen und wurde auf das Jahr 2006 verschoben. Dieser Entschluss erwies sich im Nachhinein als folgenschwer – bei einer Sichtung des Grabungsplatzes im Februar 2006 mussten wir feststellen, dass dieser im letzten Jahr geplündert worden war. Besonders das gut erhaltene Grab 2 war vollkommen zerstört worden und zahlreiche Keramikscherben und Knochenfragmente bezeugten die ehemalige Reichhaltigkeit seines Inventars. Die Plünderer hatten ganz offensichtlich das eigentliche bzw. das unterste Bestattungsniveau nicht erreicht, denn eine Art Grube über dem anstehenden Felsen war noch mit Füllsand gefüllt und zahlreiche Knochenfragmente und Scherben lagen darin verstreut. Insofern war es nötig, diese Störungen zu säubern und die verbliebenen Grabbauten (Gräber 5 und 6 im Süden) zu untersuchen. Der nunmehr gestörte Zustand des Fundplatzes ließ die Anzahl der Gräber ohne Grabung nicht klar bestimmen. Vergleichbar mit Grab 5, beinhaltete auch die Bestattung in Grab 6 Reste von Schmuck – im Bereich des Halses kamen unter dem Schädel mehrere Perlen zum Vorschein – es handelt sich um diverse Röllchen- und Ringperlen aus Fayence, Straußeneischale und Knochen, die ehemals zu einer Halskette zusammengefasst waren (KIR 236.21). Grab 2 bildet den Mittelpunkt des Friedhofes. 2005 stand die Kuppel des Grabes noch über 1,20 m hoch an. Diese Steinstruktur war von den rezenten Räubern jedoch komplett auseinander genommen worden. Die Nord- und Westseite waren dementsprechend mit Geröll bedeckt. Im Osten schließt der höchste der natürlichen Felsbrocken an. Die Plünderer hatten ihre Aktivität auf dem Niveau der untersten Steinlage der ehemaligen Kuppel eingestellt und wir fanden eine annähernd runde Fläche von ca. 3 m Durchmesser vor. Zahlreiche Scherbenfragmente und Knochenfragmente zeigten, dass die Räuber bis zu diesem Niveau fündig geworden waren. Doch als wir die sandige Füllung bis zum gewachsenen Felsen aushoben, kamen zahlreiche Knochenfragmente und weitere Keramik zum Vorschein. Im südlichen Teil der Grube lagen Reste von Armknochen noch annähernd im Verband zusammen. Dazwischen kamen zahlreiche Fayence-Ringperlen zutage, die ehemals zu einer Kette bzw. einem Armband zusammengeknüpft waren. Die Ausgrabung von KIR 236 machte deutlich, dass es sich um einen kleinen Friedhof der späteren Kerma Moyen/Kerma Classique Zeit handelt. Insgesamt vier Gräber konnten innerhalb der Bienenwabenförmig angeordneten Einzelstrukturen differenziert werden. Einige Aspekte sprechen stark dafür, dass „zweistöckige“ Bestattungen vorlagen – zunächst wurden direkt über den gewachsenen Felsen Grabbeigaben und ein Leichnam platziert. Diese „Grube“ wurde mit Sand gefüllt und von einem Lage Steinplatten nach oben abgeschlossen. Darüber baute man die charakteristische Kuppel – auch hier wurden zumindest Gegenstände deponiert, eine weitere Bestattung ist darüber hinaus sehr wahrscheinlich. Aufgrund des gestörten Befundes von KIR 236 kann nicht mit Gewissheit festgestellt werden, in welcher zeitlichen Abfolge die Bestattungen über und unterhalb der Steinlegung der Kuppel zueinander stehen. Da insgesamt nur Kermazeitliche Keramik zum Vorschein kam, ist eine zeitliche Nähe wahrscheinlich. Grab 2 des kleinen Friedhofes scheint mit seinen beachtlichen Ausmaßen und eindeutiger Mehrstöckigkeit das Hauptgrab gewesen zu sein. Im direkt anschließenden Grab 6 wurde ein noch nicht erwachsenes Individuum mit derselben Keramik als Beigabe bestattet – eine Deutung von KIR 236 als Familienfriedhof ist insofern nahe liegend. Die Beigabenkeramik von KIR 236 ist besonders interessant – wie bereits 2005 bei Kuppelgräbern aus der Napatanischen Zeit festgestellt werden konnte, so können zwei Traditionen innerhalb der Töpferwaren unterschieden werden. So liegen einerseits Produkte vor, die eindeutig als lokale, grobe Ware gekennzeichnet sind, andererseits aber auch dekorierte Gefäße aus sehr feinem Ton, die eventuell als Importe aus dem Gebiet um Kerma anzusprechen sind. Ob diese unterschiedlichen Traditionen Rückschlüsse auf die in derartigen Gräbern Bestatteten zulassen, wäre durch weitere Grabungen und Keramikauswertung auf einer breiteren Materialbasis abzuklären.